The ionization chamber is the simplest of all gas-filled radiation detectors, and is widely used for the detection and measurement of certain types of ionizing radiation; X-rays, gamma rays, and beta particles. Conventionally, the term "ionization chamber" is used exclusively to describe those detectors which collect all the charges created by direct ionization within the gas through the application of an electric field. It only uses the discrete charges created by each interaction between the incident radiation and the gas, and does not involve the gas multiplication mechanisms used by other radiation instruments, such as the Geiger counter or the proportional counter. Ion chambers have a good uniform response to radiation over a wide range of energies and are the preferred means of measuring high levels of gamma radiation. They are widely used in the nuclear power industry, research labs, radiography, radiobiology, and environmental monitoring. Schematic diagram of parallel plate ion chamber, showing drift of ions due to electric field. Electrons typically drift 1000 times faster than positive ions due to their smaller mass. Plot of ion current against voltage for a wire cylinder gaseous radiation detector. The ion chamber uses the lowest usable detection region. An ionization chamber measures the charge from the number of ion pairs created within a gas caused by incident radiation. [nb 1] It consists of a gas-filled chamber with two electrodes; known as anode and cathode. The electrodes may be in the form of parallel plates (Parallel Plate Ionization Chambers: PPIC), or a cylinder arrangement with a coaxially located internal anode wire. A voltage potential is applied between the electrodes to create an electric field in the fill gas. When gas between the electrodes is ionized by incident ionizing radiation, ion-pairs are created and the resultant positive ions and dissociated electrons move to the electrodes of the opposite polarity under the influence of the electric field. This generates an ionization current which is measured by an electrometer circuit. The electrometer must be capable of measuring the very small output current which is in the region of femtoamperes to picoamperes, depending on the chamber design, radiation dose and applied voltage. Each ion pair created deposits or removes a small electric charge to or from an electrode, such that the accumulated charge is proportional to the number of ion pairs created, and hence the radiation dose. This continual generation of charge produces an ionization current, which is a measure of the total ionizing dose entering the chamber. However, the chamber cannot discriminate between radiation types (beta or gamma) and cannot produce an energy spectrum of radiation. The electric field also enables the device to work continuously by mopping up electrons, which prevents the fill gas from becoming saturated, where no more ions could be collected, and by preventing the recombination of ion pairs, which would diminish the ion current. This mode of operation is referred to as "current" mode, meaning that the output signal is a continuous current, and not a pulse output as in the cases of the Geiger–Müller tube or the proportional counter. Referring to the accompanying ion pair collection graph, it can be seen that in the "ion chamber" operating region the collection of ion pairs is effectively constant over a range of applied voltage, as due to its relatively low electric field strength the ion chamber does not have any "multiplication effect". This is in distinction to the Geiger–Müller tube or the proportional counter whereby secondary electrons, and ultimately multiple avalanches, greatly amplify the original ion-current charge. The following chamber types are commonly used. This is a chamber freely open to atmosphere, where the fill gas is ambient air. The domestic smoke detector is a good example of this, where a natural flow of air through the chamber is necessary so that smoke particles can be detected by the change in ion current. Other examples are applications where the ions are created outside the chamber but are carried in by a forced flow of air or gas. These chambers are normally cylindrical and operate at atmospheric pressure, but to prevent ingress of moisture a filter containing a desiccant is installed in the vent line. This is to stop moisture building up in the interior of the chamber, which would otherwise be introduced by the "pump" effect of changing atmospheric air pressure. These chambers have a cylindrical body made of aluminium or plastic a few millimetres thick. The material is selected to have an atomic number similar to that of air so that the wall is said to be "air equivalent" over a range of radiation beam energies. This has the effect of ensuring the gas in the chamber is acting as though it were a portion of an infinitely large gas volume, and increases the accuracy by reducing interactions of gamma with the wall material. The higher the atomic number of the wall material, the greater the chance of interaction. The wall thickness is a trade-off between maintaining the air effect with a thicker wall, and increasing sensitivity by using a thinner wall. These chambers often have an end window made of material thin enough, such as mylar, so that beta particles can enter the gas volume. Gamma radiation enters both through the end window and the side walls. For hand-held instruments the wall thickness is made as uniform as possible to reduce photon directionality though any beta window response is obviously highly directional. Vented chambers are susceptible to small changes in efficiency with air pressure  and correction factors can be applied for very accurate measurement applications. These are similar in construction to the vented chamber but are sealed and operate at or around atmospheric pressure. They contain a special fill gas to improve detection efficiency as free electrons are easily captured in air-filled vented chambers by neutral oxygen which is electronegative, to form negative ions. These chambers also have the advantage of not requiring a vent and desiccant. The beta end window limits the differential pressure from atmospheric pressure that can be tolerated, and common materials are stainless steel or titanium with a typical thickness of 25 µm. The efficiency of the chamber can be further increased by the use of a high pressure gas. Typically a pressure of 8-10 atmospheres can be used, and various noble gases are employed. The higher pressure results in a greater gas density and thereby a greater chance of collision with the fill gas and ion pair creation by incident radiation. Because of the increased wall thickness required to withstand this high pressure, only gamma radiation can be detected.These detectors are used in survey meters and for environmental monitoring. Most commonly used for radiation therapy measurements is a cylindrical or "thimble" chamber. The active volume is housed within a thimble shaped cavity with an inner conductive surface (cathode) and a central anode. A bias voltage applied across the cavity collects ions and produces a current which can be measured with an electrometer. Parallel-plate chambers are shaped like a small disc, with circular collecting electrodes separated by a small gap, typically 2mm or less. The upper disc is extremely thin, allowing for much more accurate near-surface dose measurements than are possible with a cylindrical chamber. Monitor chambers are typically parallel plate ion chambers which are placed in radiation beams to continuously measure the beam's intensity. For example, within the head of linear accelerators used for radiotherapy, multi-cavity ionization chambers can measure the intensity of the radiation beam in several different regions, providing beam symmetry and flatness information. Early versions of the ion chamber were used by Marie and Pierre Curie in their original work in isolating radioactive materials. Since then the ion chamber has been a widely used tool in the laboratory for research and calibration purposes. To do this a wide variety of bespoke chamber shapes, some using liquids as the ionized medium, have been evolved and used. Ion chambers are used by national laboratories to calibrate primary standards, and also to transfer these standards to other calibration facilities. The condenser chamber has a secondary cavity within the stem which acts as a capacitor. When this capacitor is fully charged, any ionization within the thimble counteracts this charge, and the change in charge can be measured. They are only practical for beams with energy of 2 MeV or less, and high stem leakage makes them unsuited to precise dosimetry. Similar in design to a parallel plate chamber, the upper plate of an extrapolation chamber can be lower using micrometer screws. Measurements can be taken with different plate spacing and extrapolated to a plate spacing of zero, i.e. the dose without the chamber. Ion chambers are widely used in hand held radiation survey meters to measure beta and gamma radiation. They are particularly preferred for high dose rate measurements and for gamma radiation they give good accuracy for energies above 50-100 keV. There are two basic configurations; the "integral" unit with the chamber and electronics in the same case, and the "two-piece" instrument which has a separate ion chamber probe attached to the electronics module by a flexible cable. The chamber of the integral instrument is generally at the front of the case facing downwards, and for beta/gamma instruments there is a window in the bottom of the casing. This usually has a sliding shield which enables discrimination between gamma and beta radiation. The operator closes the shield to exclude beta, and can thereby calculate the rate of each radiation type. Some hand held instruments generate audible clicks similar to that produced by a G-M counter to assist operators, who use the audio feedback in radiation survey and contamination checks. As the ion chamber works in current mode, not pulse mode, this is synthesised from the radiation rate. For industrial process measurements and interlocks with sustained high radiation levels, the ion chamber is the preferred detector. In these applications only the chamber is situated in the measurement area, and the electronics are remotely situated to protect them from radiation and connected by a cable. Installed instruments can be used for measuring ambient gamma for personnel protection and normally sound an alarm above a preset rate, though the Geiger–Müller tube instrument is generally preferred where high levels of accuracy are not required. Moisture is the main problem that affects the accuracy of ion chambers. The chamber's internal volume must be kept completely dry, and the vented type uses a desiccant to help with this. Because of the very low currents generated, any stray leakage current must be kept to a minimum in order to preserve accuracy. Invisible hygroscopic moisture on the surface of cable dielectrics and connectors can be sufficient to cause a leakage current which will swamp any radiation-induced ion current. This requires scrupulous cleaning of the chamber, its terminations and cables, and subsequent drying in an oven. "Guard rings" are generally used as a design feature on higher voltage tubes to reduce leakage through or along the surface of tube connection insulators, which can require a resistance in the order of 1013 Ω. For industrial applications with remote electronics, the ion chamber is housed in a separate enclosure which provides mechanical protection and contains a desiccant to remove moisture which could affect the termination resistance. In installations where the chamber is a long distance from the measuring electronics, readings can be affected by external electromagnetic radiation acting on the cable. To overcome this a local converter module is often used to translate the very low ion chamber currents to a pulse train or data signal related to the incident radiation. These are immune to electromagnetic effects. Ionization chambers are widely used in the nuclear industry as they provide an output that is proportional to radiation dose They find wide use in situations where a constant high dose rate is being measured as they have a greater operating lifetime than standard Geiger–Müller tubes, which suffer from gas break down and are generally limited to a life of about 1011 count events. Additionally, the Geiger–Müller tube cannot operate above about 104 counts per second, due to dead-time effects, whereas there is no similar limitation on the ion chamber. The ionization chamber has found wide and beneficial use in smoke detectors. In an ionisation type smoke detector, ambient air is allowed to freely enter the ionization chamber. The chamber contains a small amount of americium-241, which is an emitter of alpha particles which produce a constant ion current. If smoke enters the detector, it disrupts this current because ions strike smoke particles and are neutralized. This drop in current triggers the alarm. The detector also has a reference chamber which is sealed but is ionized in the same way. Comparison of the ion currents in the two chambers allows compensation for changes due to air pressure, temperature, or the ageing of the source. Diagram of a nuclear medicine dose calibrator or radionuclide calibrator that uses an ionization chamber. The dipper is used to give a reproducible source position. In medical physics and radiotherapy, ionization chambers are used to ensure that the dose delivered from a therapy unit or radiopharmaceutical is what is intended. The devices used for radiotherapy are called "reference dosimeters", while those used for radiopharmaceuticals are called radioisotope dose calibrators - an inexact name for radionuclide radioactivity calibrators, which are used for measurement of radioactivity but not absorbed dose. A chamber will have a calibration factor established by a national standards laboratory such as ARPANSA in Australia or the NPL in the UK, or will have a factor determined by comparison against a transfer standard chamber traceable to national standards at the user's site. In the United Kingdom the HSE has issued a user guide on selecting the correct radiation measurement instrument for the particular application concerned. This covers all radiation instrument technologies, and is a useful comparative guide to the use of ion chamber instruments. Wikimedia Commons has media related to Ionization chambers. ^ a b c d e f Knoll, Glenn F (1999). Radiation detection and measurement (3rd ed.). New York: Wiley. ISBN 978-0-471-07338-3. ^ Seco, Joao; Clasie, Ben; Partridge, Mike (21 October 2014). "Review on the characteristics of radiation detectors for dosimetry and imaging". Physics in Medicine and Biology. 59 (20): R303–R347. Bibcode:2014PMB....59R.303S. doi:10.1088/0031-9155/59/20/R303. PMID 25229250. ^ a b Hill, Robin; Healy, Brendan; Holloway, Lois; Kuncic, Zdenka; Thwaites, David; Baldock, Clive (21 March 2014). "Advances in kilovoltage x-ray beam dosimetry". Physics in Medicine and Biology. 59 (6): R183–R231. Bibcode:2014PMB....59R.183H. doi:10.1088/0031-9155/59/6/R183. PMID 24584183. ^ "Ionization Chambers". Health Physics Historical Instrumentation Collection. Oak Ridge Associated Universities. Retrieved 16 April 2017. ^ Taylor, D.; Sharpe, J. (April 1951). 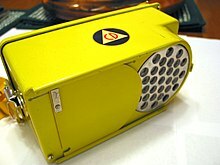 "Nuclear particle and radiation detectors. Part 1: Ion chambers and ion-chamber instruments". Proceedings of the IEE - Part II: Power Engineering. 98 (62): 174–190. doi:10.1049/pi-2.1951.0058. ^ Hill, R; Mo, Z; Haque, M; Baldock, C (2009). "An evaluation of ionization chambers for the relative dosimetry of kilovoltage x-ray beams". Medical Physics. 36 (9Part1): 3971–3981. Bibcode:2009MedPh..36.3971H. doi:10.1118/1.3183820. PMID 19810470. ^ Mo, L.; Reinhard, M.I. ; Davies, J.B.; Alexiev, D.; Baldock, C. (April 2006). "Calibration of the Capintec CRC-712M dose calibrator for 18F". Applied Radiation and Isotopes. 64 (4): 485–489. doi:10.1016/j.apradiso.2005.09.006. PMID 16293417. ^ Seco, Joao; Clasie, Ben; Partridge, Mike (Oct 2014). "Review on the characteristics of radiation detectors for dosimetry and imaging". Physics in Medicine and Biology. 59 (20): R303–R347. Bibcode:2014PMB....59R.303S. doi:10.1088/0031-9155/59/20/R303. PMID 25229250. ^ "Selection, use and maintenance of portable monitoring instruments" (PDF). Health & Safety Executive. 2001. This page was last edited on 3 March 2019, at 09:52 (UTC).